Jeremy Myerson: "Stigma of growing old must be creatively challenged"
"The stigma of growing old needs to be creatively challenged"
Designers need to overcome deep-rooted stereotypes and take on the challenges presented by ageing populations, says Jeremy Myerson, curator of the New Old exhibition that just opened at London's Design Museum. Unless you've spent the last decade living in a cave, you will know that every developed nation now has a rapidly ageing population. This demographic shift towards a society in which there are large numbers of older people and decreasing numbers of young people offers both challenges and opportunities for designers. Across Europe, half the population will be over 50 by 2020. In the UK, 70 per cent of population growth over the next 25 years will be in the over-60 age group and it is predicted that half of all children born today will live to be 103. Our life expectancy at birth has increased by five years in the past 20, so more years are a given for most us. This longer lifespan is the direct result of factors including falling mortality rates, better diet and advances in medical science, and should be something to celebrate. Instead we persist in seeing population ageing as a demographic time bomb, a disaster waiting to happen. Every year in winter, at a time of annual crisis in Britain's overflowing hospitals, the headlines about elderly people clogging up the care system reignite all the old, negative arguments. The wider question, of course, is how we will live these extra years most of us are now granted. Will we enjoy independence and a good quality of life? Or will we become isolated and marginalised? In other words, will we have years full of life, or life full of years? Design has a critical role to play in how successfully we will age: it affects how we build our homes, how we work and travel, and what products and services we will use in the future. So we need to start thinking now about design for societies in which older people will form a significant portion of the population. Already, one in four people in Japan are 65 or older. What holds back designers from leaping whole-heartedly into this burgeoning field? Surely it's a no-brainer for the best creative minds to focus immediately on this area. The big obstacle, as I see it, is not technical – it is cultural. There remain deep-rooted, corrosive stereotypes around ageing, which have stayed the hand of a design community rooted in the twin cultures of youth and cool. The stigma of growing old persists and this needs to be creatively challenged if design is to be ready for demographic change. I've just curated an exhibition at the Design Museum in London called New Old: Designing For Our Future Selves, which addresses this theme of using design to challenge stereotypes and remove stigma. The show presents many examples to show how the identity of the "new old" is in transition, with perceptions being shifted by creative new ideas in fashion, furniture, products and communication. Exhibits range from NB Studio's energetic campaign to redesign the UK's famous "elderly people" road sign – replacing its sad, stereotypical silhouette of a stooping couple with a walking stick with new, vibrant ideas – to Lanzavecchia & Wai's No Country for Old Men collection of furniture, which challenges the "chintz and net curtains" image of ageing by combining contemporary design with practical support for older people. There's a look at the fashion industry, famous for promoting the glamour of youth but now using the much older woman to sell style. And there are several special design commissions in the exhibition that chip away at well-worn stereotypes. 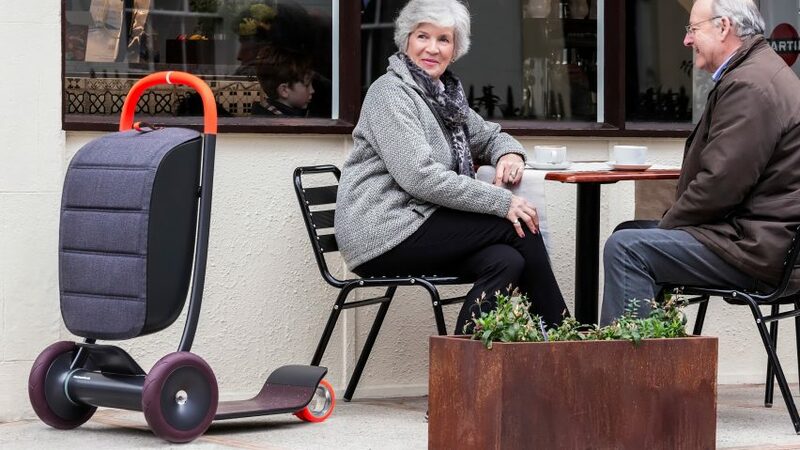 PriestmanGoode's Scooter for Life, for example, offers older people greater independence without the stigma associated with a mobility scooter. Konstantin Grcic's Head in the Sky, an outdoor metal structure inspired by a Renaissance painting, counters the notion of retreat from the world in later life. And Exchange by Special Projects is a living installation that allows young visitors to the exhibition to spend time in conversation with a real older person, thus addressing misconceptions head-on through conversation. Projects like these are challenging the underlying model that perpetuates stigma, a medical model of ageing that views growing older as a disease to be cured. This model is primarily about dependency, decrepitude and death, and is why we have so many designs for older people that belong in a hospital – ghastly aids and appliances that try to help, but end up stigmatising the user. We need to think differently about ageing. At a time of profound demographic change, the design community might usefully view growing older less in terms of addressing medical deficits and more in terms supporting a social model of ageing (productive new connections and aspirations in later life) and even a cultural model of ageing (this period of life is so unique and special that it demands particular cultural and creative attention). This is because future cohorts of ageing populations will work, travel, contribute and crave new experiences and relationships for longer than any before in human history. Across the spectrum of design, there are now some encouraging signs that the creative will and imagination is there to counter the stereotypes. Getting older is a natural part of life that will happen to all of us. We just need more designers to wake up to the potential that is out there, as we head into the century of the centenarian. Jeremy Myerson is a design writer and academic. He is the Helen Hamlyn Professor of Design at the Royal College of Art, a visiting fellow at the Oxford Institute of Population Ageing at the University of Oxford, and director of the WORKTECH Academy, a global knowledge network on the future of work. Jeremy co-founded the Helen Hamlyn Centre for Design at the RCA in 1999 and was its director for 16 years, helping to pioneer the practice of inclusive design in response to population ageing. He is the author of many books on design and innovation.